Are you looking to develop your speaking and leadership skills, ace an interview and ignite your career? 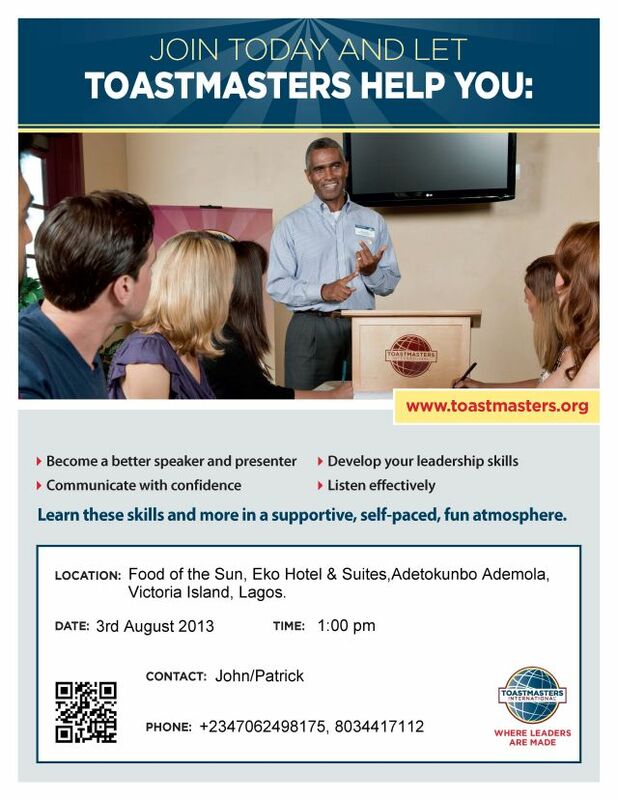 Then head to the Toastmasters Meeting on Saturday. Toastmasters International is a world leader in communication and leadership development. Admission is free for all. If you are in Lagos, here you go. There are others in Lagos and around Nigeria though. You can search here . You could also call any of the numbers above. I keep telling you how this is a cheap but great way to develop yourself. Guess what? Many people are going to read this post but do nothing about what they have read. Would you be among? Don’t miss this! This entry was posted in Aye!, Career, DIY, Life skills and tagged Adetokunbo Ademola, Eagles Toastmasters, Eko Hotel, Lagos, Leadership development, Organizations, Self Improvement, Toastmasters International, Victoria Island. Bookmark the permalink. ← Youth? Submit your project proposal to UNESCO!